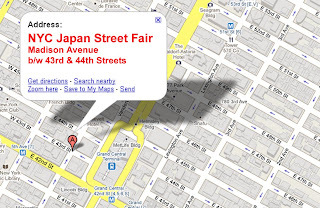 The NYC Japan Street Fair: The NYC Japan Street Fair is TOMORROW! The NYC Japan Street Fair is TOMORROW! The NYC Japan Street Fair is TOMORROW! We're so excited! We're honored to have major magazines publicize the Fair and even have some TV networks report about it tomorrow, which is unbelievably awesome. Also, much thanks to the fabulous attention we received from the Twitter world and blogospheres! We love your enthusiasm. We just hope the weather will be kind to us. The forecast says 40% chance of showers - not too much to worry about but fingers crossed! We hope everyone has a great time enjoying your okonomiyaki, udon, konnyaku, chocolate soymilk, tabi socks, the performances, and more at the NYC Japan Street Fair! Remember, the NYC Japan Street Fair is part of the larger street fair on Madison Avenue that spans 15 blocks, up to 57th Street. After you get your fill of the NYC Japan Street Fair, you still got 14 more blocks of street fair to see. Got general questions? Feel free to ask the ticket booth (#40). Thanks a ton and see you all there! 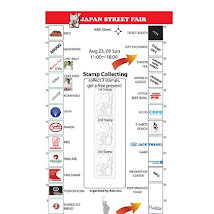 I will be attending the NYC Japan Street Fair and I noticed that it states no price but there is a ticket booth. agreed, it was extremely crowded. waiting in line for 45 mins for okonomiyaki is ridiculous. but i did it anyway! and got shoved around and witnessed a lot of rude people trying to cut in line. hopefully next year they get more than one block. The fair was 15 blocks and interconnected with another fair going on.